541A Kastar Tube Bender 1/4'' O.D. Kastar Tube Bender 1/4'' O.D. bends copper, brass, brake lines and bundy weld tubing up to 1/4 OD (outer diameter) to 360 without kinks. The Kastar Tube Bender is made of zinc die-cast for durability. Products in the same category as the 541A Kastar Tube Bender 1/4'' O.D. Kastar Tube Bender 1/4'' O.D.. Bends tubing up to 1/4 OD (outer diameter) to 360 without kinks. For copper, brass, brake lines and bundy weld tubing. Zinc die-cast for durability. Kastar Brake Caliper Press. Four tools in one. Works on various single, dual and quad piston calipers. Centrally distributes force. Compact design 360 ratchet swing allows access at any angle. Kastar Brake Resetting Gauge. Wide working range allows measurements from 6-1/2 to 13-1/4 in diameter. Locks the measurement at the appropriate inch or metric calibration during use. Kastar Brake Bleeder Wrench 8mm X 10mm. For bleeding brakes on late model cars with 8mm and 10mm six-point fittings 8mm end designed to fit recessed fittings on many FWD vehicles. Kastar Brake Caliper Bit Set. 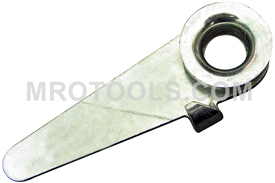 Used for removing/installing fasteners on automotive brake calipers. 1/4, 3/8, 7mm, 8mm and 10mm Hex Bits; T40, T45, T50 and T55 TORX Bits; 6mm Triple Square Bit. Kastar Brake Drum And Rotor Puller. Saves time and reduces damage to the wheel bearing by eliminating the need to repeatedly strike or heat the brake drum to free it from the hub. Kastar Rapid Deflators With Tpms Location Marks. Sockets are clearly marked with LF, RF, LR & RR for easy identification so tires can be returned to original position without TMPS needing to be reset. Kastar Tire Valve Installer. Simplify inserting any tubeless tire valve. Swivel head screws onto cap thread of tire valve. Handle is used as a lever to pull tire valve into rim hole. The 541A Kastar Tube Bender 1/4'' O.D. is one of thousands of quality tooling products available from MRO Tools. Please browse Kastar Brake and Wheel Tools for tools similar to the 541A Kastar Tube Bender 1/4'' O.D..
541A Kastar Tube Bender 1/4'' O.D. description summary: Kastar Tube Bender 1/4'' O.D.. Bends tubing up to 1/4 OD (outer diameter) to 360 without kinks. For copper, brass, brake lines and bundy weld tubing. Zinc die-cast for durability. Quantity discounts may be available for the 541A Kastar Tube Bender 1/4'' O.D.. Please contact MRO Tools for details.